Apologetics Press has been blessed to provide the public with several outstanding volumes that address the most pressing scientific issues of our day—as they relate to evolution, Creation, and the Bible. These have included The Truth About Human Origins, The Scientific Case for Creation, and Creation Compromises. In addition to the multitude of scholarly articles available on our Web site that discuss scientific issues related to the creation-evolution controversy, we have been in need of a fresh, candid, scientific examination of evolution. We are pleased to announce that this need has now been met. 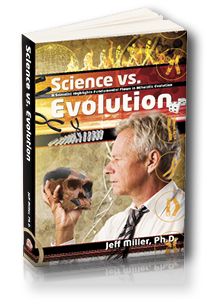 Our resident scientist, Dr. Jeff Miller, has completed a lengthy analysis in which he methodically examines the laws of science and their implications regarding naturalistic evolution. Discovering fundamental flaws in five of the central tenets of evolution, Dr. Jeff sets forth modern scientific evidence that decisively refutes evolution. In the process, the evidence strongly supports biblical Creation and the existence of God. Consisting of nearly 300 colorful pages, with pictures, tables, and illustrations, the book also contains useful author and subject indices for easy reference. Review questions at the end of each chapter make the book conducive to classroom use. A special section of the book consists of six appendices that address 21 of the typical quibbles levied against creationists.